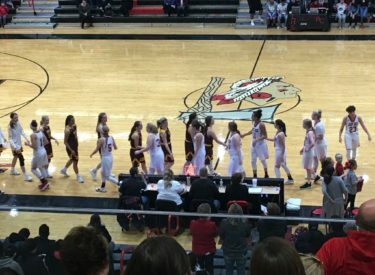 The Liberal Lady Redskins overcame foul trouble and a few issues with the Hays press to win handily in the WAC opener Friday night in the Big House. Katie Horyna and Machia Mullens both fouled out but Liberal won 61-42. The Lady Redskins led 9-5 after one quarter and 24-13 at the half. Liberal built a 32-16 lead in the third quarter and led 43-31 after three. LHS led by as many as 21 on the way to the win. Machia Mullens scored 16 to lead Liberal. Katie Horyna scored 12. Audrey Gilmore, Whitney Hay, and Aubrey Warden scored nine a piece. Liberal maded 7-20 three pointers while Hays was 2-9. LHS was 17-19 at the foul line and Hays was 14-24. Liberal has won six of the past seven against Hays. The Lady Redskins are 7-0 for the first time since 2009 and 1-0 in the WAC. Hays is 3-3 and 0-1 in the WAC. Liberal plays at 6-1 Garden City Tuesday night at 6 with Redskin Pre-game at 5:45 on 1270 and kscbnews.net.